Introduction: Ureteral injuries during colectomy are rare with a reported incidence of <1%. The purpose of this study was to assess the impact of laparoscopy on the incidence of iatrogenic ureteral injury at a single institution. Methods: Following Institutional-Review-Board approval, fifteen patients who underwent colectomy complicated by a ureteral injury from 2005 to 2010 were identified from a prospectively maintained database. Patient records were retrospectively reviewed. Results: A total of 5,729 colectomies were performed during the study time period. Fifteen ureteral injuries occurred resulting in a 0.3% incidence of iatrogenic ureteral injury. Evaluation by patient demographic demonstrated 9(60%) injuries occurred in females and 7(47%) patients had prior abdominal operations. Operative indications included: inflammatory bowel disease(n=7), diverticulitis(n=3), malignancy(n=5). No difference was observed by surgeon experience or specialty training. Operative assessment demonstrated 13(87%) operations were elective. Seven(47%) patients underwent laparoscopic procedures with 2 open conversions. Of the 5,729 colectomies, 4,669 were performed open and 1,060 laparoscopically. The incidence of ureteral injury with laparoscopic colectomy was significantly increased (0.7% vs. 0.2%, p=0.014). No difference in time to recognition was demonstrated by operative approach. Mean operative blood loss was 920mL. Regarding the location of the ureteral injuries, 9 were left, 5 right, and one bilateral. Seven(47%) injuries were identified intraoperatively and 8(53%) postoperatively (range of 0-16 days to diagnosis). No difference was observed in intraoperative identification of ureteral injury in patients who underwent preoperative ureteral stent placement(n=7) versus those who did not (42%(3/7) vs. 50%(4/8)). Time to postoperative recognition also did not differ by use of ureteral stents (7-days (range 1-16 days) versus 3-days (range 1-9 days)), respectively. 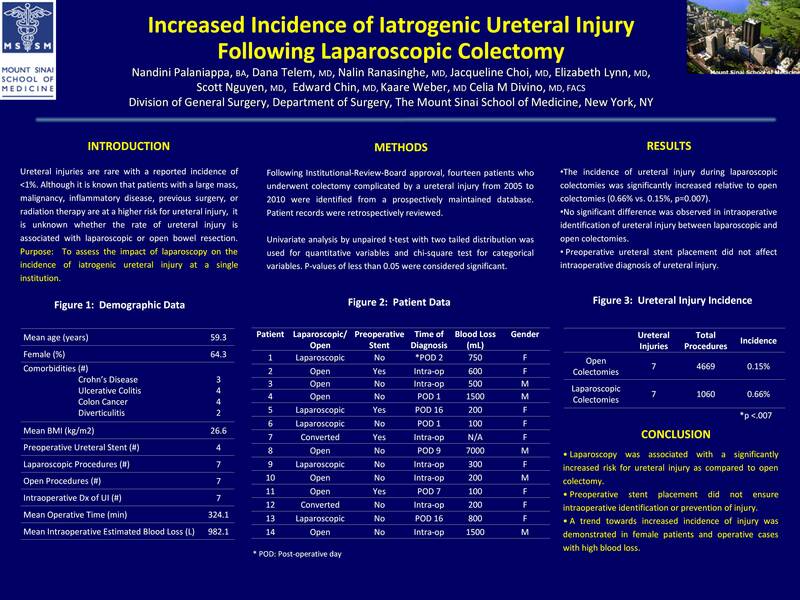 Conclusion: There was a significant increase in the incidence of iatrogenic ureteral injuries with laparoscopy compared to open colectomies. Moreover, preoperative stent placement did not ensure intraoperative identification of injury. Female gender and increased operative blood loss appear to predispose to injury.